This is a quick and easy sugar scrub for hands and feet. It uses 3 ingredients and 5 minutes to make. 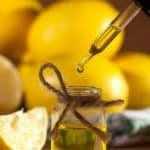 Combine the raw sugar, olive oil, and lemon essential oil in a bowl. Store in a sealed container for up to 2 months. To use: Apply sugar scrub to wet skin. Massage the scrub into your skin and then rinse with water. After drying, apply lotion and put on socks and/or gloves to help moisturize your hands and feet.